Getting in the mood for Halloween, our Monday morning art activity is sure to be a big hit with the grandparents! 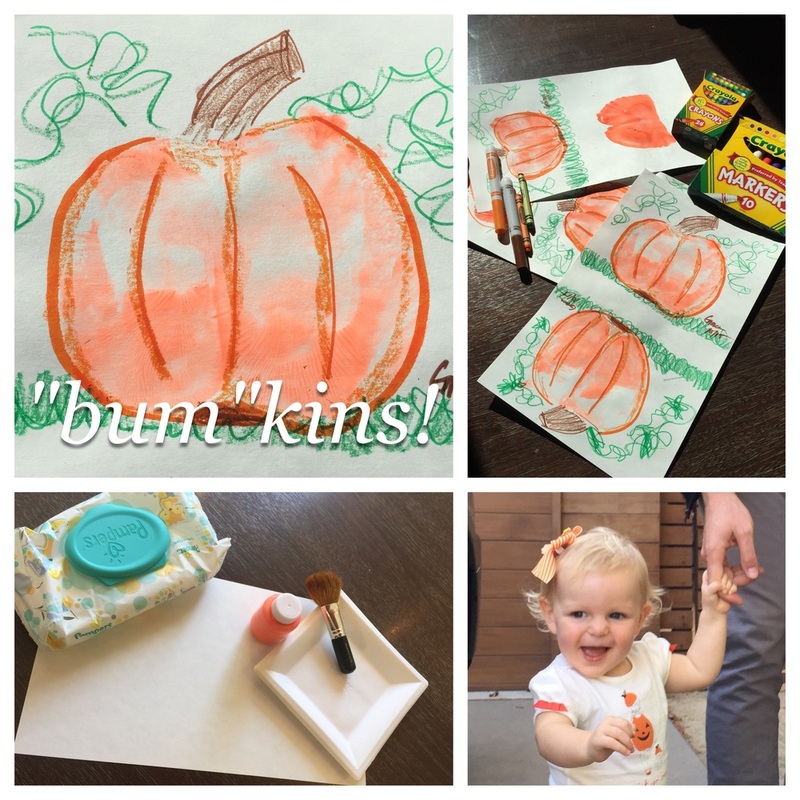 Instead of painting pumpkins, we used Graceface's "bum" as a stamp to make a pumpkin shape-- fortunately it's 80 degrees so putting together the project outside got no complaints from the wee one who reveled in bath time after! Let dry while babe takes a quick bath. Decorate with crayons and/or markers to better illustrate the pumpkin theme!! One of my favorite restaurants growing up -- and places to hit whenever I was home from the East coast - has always been Hobees. Now, although just about every location leaves a ton to be desired for from an ambiance perspective, the food and service is always on par making it a family favorite for our next generation. As their website says, Hobee's is an award winning Silicon Valley tradition since 1974! In my younger years, I came for the signature blueberry coffee cake with drippy, melting butter running down the crumbling sides and an energy blend (smoothie). Today, without hesitation my order is the "Almost Joe's" scramble with ground beef, gouda and spinach. Delicious and filling all day! While I have always loved the place, what makes me love it even more is how kid-friendly the staff is and how accommodating they are to families. The clientle is a mix - lots of VC/Start-up CEOs talking nerdy over coffee and a few tables with multi-generations of families and others filled with ladies-who-lunch-types. While they serve breakfast, lunch and dinner, we make breakfast a habit. Right when we arrive, they greeted Grace with a smile, pulled up a high-chair to our table and quickly brought out a playmat with crayons. Many places do this but Hobee's goes above and beyond bringing a smiley face fruit plate out right away - giving us a few seconds to catch our breath, have a first jolt of coffee and peruse the menu while she plays and eats. At the Palo Alto location, there is a whole wall of books and toys to occupy kiddos while we eat and thought we haven't checked it out yet, apparently kids eat free on Wednesday nights! As I mentioned earlier, one focus when launching this blog was to highlight kid-friendly restaurants we were discovering as a family as we became re-acquainted with Silicon Valley. My awesome parents got us gift certificates to just about every restaurant on University Ave when we moved-in as a house-warming gift, and one that I was really looking forward to was Pluto's. Back in DC we had awesome sandwich shops like Taylor Gourmet and fast, fresh salads-to-go like Sweetgreen. Trying to find some semblance in Palo Alto has been a challenge, but I had high hopes for Pluto's. From the outside, it looks so kid-friendly with the outer space theme and open air concept. But the furniture is too packed to get a stroller through, staff completely unfriendly and unhelpful, and while they do have a robust children's menu, the food just isn't fresh or delicious. We've given the restaurant a few shots and each time come up empty. Fortunately, there are a bounty of other great options! When I set out to write this blog, one goal was to highlight the kid-friendly places we were discovering. While I had grown up in the area, moving back after 13 years away and now with a 1 year old and pregnant with number 2- I have the opportunity to see the Peninsula through a mom lens. 6pm Saturday night, I looked at my husband and begged him to take me out to dinner. Sure we both glanced at the clock knowing that witching hour (7pm) was creeping our way - but I didn't want to mess up the clean kitchen and just wanted to get out of the house. Always craving Mexican, we decided to walk over to Tacolicious (632 Emerson Street Palo Alto, CA) - and boy was I glad we did! Every time we have gone has been great service, great food, and extremely kid-friendly. The restaurant was crowded but we parked the stroller right on up to the empty lower handi-cap bar. Instantaneously hot chips and delicious tangy salsa were before us while the bartender got our drink order. We quickly observed just how many families were enjoying their Saturday evening there - at least half the tables filled with multiple generations but the restaurant didn't feel overly "kiddie" at all. My favorite part of Tacolicious is that even if you are sitting inside, the giant windows make you feel like you are dining al fresco. We quickly ordered a variety of tacos to share and summer squash empanadas and each bite was better than the one before. When I asked for the check just as our food came/ the babe was starting down a dark path - our bartender offered boxes to go, gave a sympathetic look, and had our check ready in 30 seconds.